Hi, I started this thread about osgEarth because the osgEarth installation information on the wiki and forum is outdated and it is unclear for beginners. Objective: I want this feature in latest FG (git) on Windows 7 64b because this can help me locate shared objects to be placed later with more precision and faster as the normal method with coordinates. 1 - I've downloaded and installed: Git for Windows, CMake GUI, Microsoft Visual Studio 2010 Express (Visual C# 2010 Express package) and Visual Studio 2010 SP1. 2 - I've downloaded the three repositories (with Git for Windows): simgear, flightgear and fgdata and the osgEarth repository too. 3 - I'm stuck in the process of Configuring Simgear (point 4 on Building section). 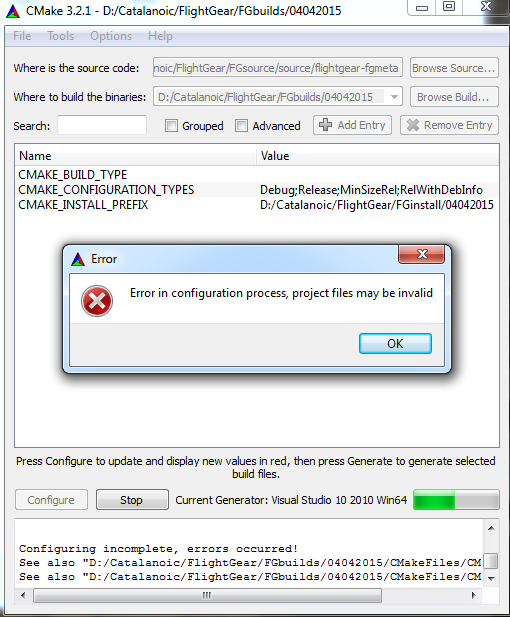 When i select Visual Studio 2010 Win64 and i press OK shows a Error window with the text: "Error in configuration process, project files may be invalid" therefore the configuration step is incomplete and appeared errors. Thankyou, I apologize because I do not write English correctly so if there are any questions please let me know. EDIT (18/04/2015): Solution (my own): Definitely I installed the prepared version of poweroftwo (3.1.0), read this post. Last edited by Catalanoic on Sat Apr 18, 2015 6:50 pm, edited 2 times in total. However, like I said previously - you really need to take step-by-step here, or the whole experience will be frustrating - applying the osgEarth patches is only the final step, but there are quite a few steps necessary before you can even look at the osgEarth branch. Basically, you need to make sure that all FG dependencies are available and that you can build FG from source - once that is the case, you would apply the osgEarth patches. Depending on your background, you may want to get in touch with a few other Windows-based contributors interested in osgEarth and maybe work out a way to work together on this - a few people here regularly build FG from source (including on Windows), and others regularly use osgEarth - so if you find even just building "stock FG" difficult, it might be easier to do a little research on the forum and do a bit of networking to work out a team of people who might be interested in regularly providing pre-built binaries with osgEarth support. Along the way, you could help to update the osgEarth docs on the wiki accordingly. The other option is filing a feature request so that the osgEarth branch will be built by the build server, so that you and others can simply download the binaries. Thankyou! But the gitorious links on the wiki are invalid! Today is all at github, right? Hooray wrote in Sat Apr 04, 2015 3:51 pm: The other option is filing a feature request so that the osgEarth branch will be built by the build server, so that you and others can simply download the binaries. This seems like a good idea, a way to get this feature in the simulator to more people. Hooray wrote in Sat Apr 04, 2015 3:51 pm: Along the way, you could help to update the osgEarth docs on the wiki accordingly. see the latest newsletter released for the repository changes or click on "Source" at the top of the forum. And your English seems just fine to me - we have many other people who regularly contribute to the wiki without possessing your English skills, so don't worry about that - also, there are others willing to help review/edit contributions made by non-native speakers. Besides, it is even possible to contribute to the wiki in your native language, too - which is another excellent way for getting involved. EDIT: Thankyou! 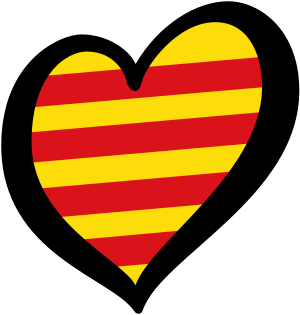 I can write in Spanish, Catalan and some German too. it seems that cmake/the GUI itself isn't yet configured properly - are you able to build trivial hello-world style applications using the cmake GUI ? Hooray wrote in Sat Apr 04, 2015 7:44 pm: it seems that cmake/the GUI itself isn't yet configured properly - are you able to build trivial hello-world style applications using the cmake GUI ? have you tried the fix suggested above ? Hooray, Catalaonic is downloading the last git version of simgear & flightgear. Is that version compatible with osgEarth? As far as I know, the commands and repositories available in the wiki are still valid and the only outdated information is the number of the version. osgEarth only works with version 3.1 and you have to download the repositories in gitorious, not in sourceforge. In any case, compiling from the source code is not an easy task, as Catalaonic have just discovered. No, the patches available do not apply cleanly onto 3.4+ - but a while ago, someone posted patches necessary to make this work - i.e. it's a handful of files that are affected IIRC, mostly the SG/FG changes due to the recent PagedLOD efforts. Pretty much everything else should apply as is using git rebase. I think poweroftwo also stated somewhere on the forum that he wants to supports "next" if possible. So yeah, I was posting under the assumption that this is what this thread is about: applying the osgEarth patches onto next. I haven't built FG in months, so I may not be up to date WRT recent changes related to this - but as far I can see, the number of files affected should still be relatively small. But it seems that this thread is more about building even just FG itself on Windows. Like I said previously, it might make sense to gather a team of people familiar with building SG/FG on Windows who have shown an interest in using the osgEarth branch and work through patching things (FG/SG) accordingly, so that the branches and instructions can be updated - and maybe even so that the build server can provide binaries in the future - currently, the barrier to entry seems pretty high for people entirely new to building software from source. I solved the error. I'll write about how I made it to work on my system.